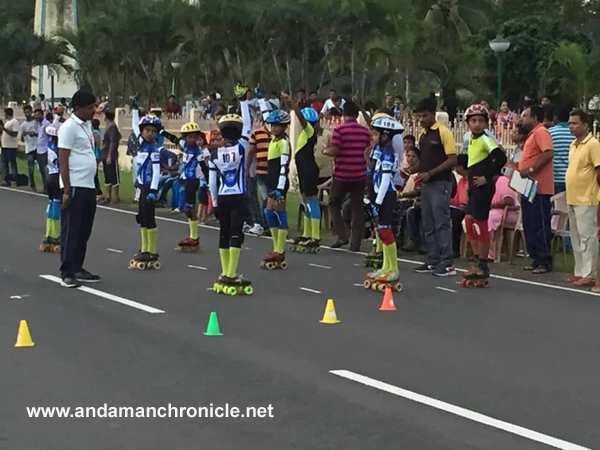 Port Blair, Sept. 10: The 3rd State Level Skating Marathon Championships were held yesterday at the Marina Park, Port Blair. 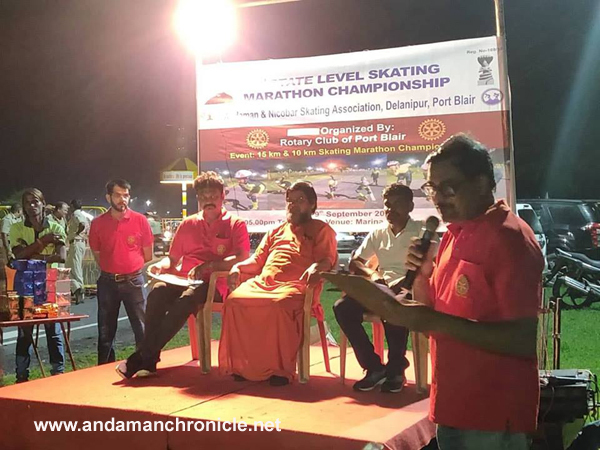 The championship was an initiative of Rotary Club of Port Blair in collaboration with Andaman Nicobar Skating Association. As many as twenty six skaters participated in their colorful attire and it was a treat to watch them skate in perfect rhythm. The Winners took away Cups, Medals, Certificate and Gifts while each got a Participation Certificate alongwith a gift. R.Calvin, RR Sai Darshan and A. Pranav were declared 1st, 2nd and 3rd in the 8-11 years 10 kms category. Incidentally they are all from Carmel Senior Secondary School. Prakriti Rao and K Ritika both of Carmel Senior Secondary School and V Jessica Carlin of Navy Children School were the top three respectively in the Girls 8-11 years 10 km category Skate. In the 11-19 years 15 Kms skate, among the boys, Aryan VS of Carmel SSS, K Suriya of Sagaritara School and K Sanjay of Mahatma Gandhi International School took the top three places and among the girls it was Somi Reddy Lakshmi Devi of Haddo Govt SSS, G Priya of Mohanpura School and Manjila Mercy of Sagaritara School who were declared the top three skaters respectively. A great evening with some great words of wisdom by Swami Shuddhanandji of Chinmaya Mission Port Blair it was a perfect setting for some good work done for the children, encouraging them in their endeavors . G Ramesh and Smt Radha of A&N Skating Association were the couple who with their team of officials ensured that all the technicalities were in place to conduct the Event in proper format. 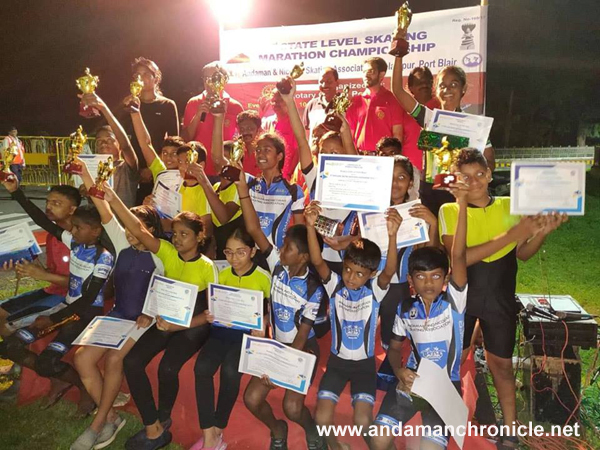 An audience of more than 250 people including Parents, Tourists, Members of Inner Wheel Club of Port Blair and Islanders witnessed and cheered the children on their skating performances. Rotary Club President Rajesh Anand, Club Secretary Dinesh Kumar, Club Treasurer Amar Gupta, Past Presidents Shahin Javanmardi, Mohd Jadwet, Shrawan Agarwal, Dinakaran Guruswamy and Abhijit Agarwal, Club Members Diwakar Moorthy, PK Kaushik and Faisal Jadwet were present to cheer the students and ensure the event was completed in due spirit.